The vice president had been at the game in Indianapolis with his wife. 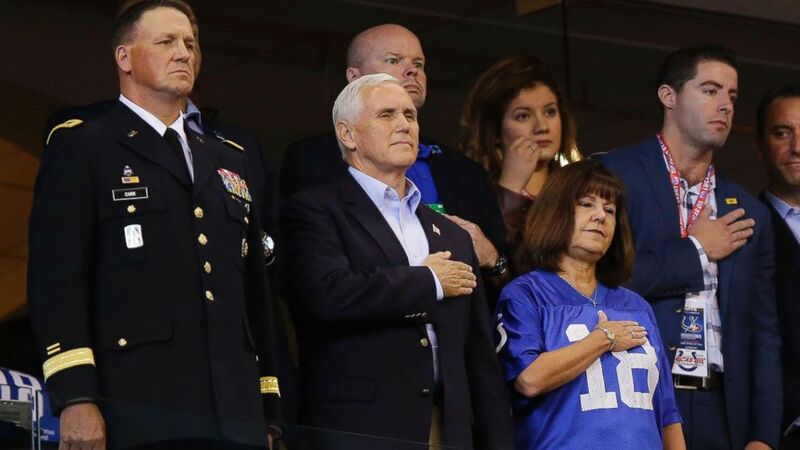 Vice President Mike Pence left an Indianapolis Colts game early today after players with the opposing team knelt during the national anthem. Pence announced his departure on Twitter, saying he would not "dignify any event" that disrespects the anthem, the flag or U.S. soldiers. President Donald Trump later weighed in, saying on Twitter that he asked the vice president to leave if any players took a knee during the anthem. "I asked @VP Pence to leave stadium if any players kneeled, disrespecting our country. I am proud of him and @SecondLady Karen." Pence was in town to watch the Colts take on the San Francisco 49ers, the very team backup quarterback Colin Kaepernick played for during the postseason. Kaepernick started taking a knee in 2016 during the performance of the national anthem in a silent protest against racial injustice. 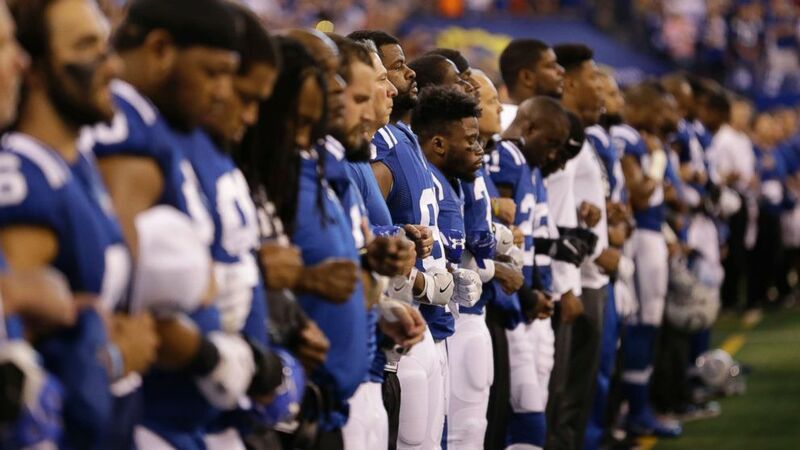 Only 49ers players kneeled today, while Indianapolis Colts players stood during the anthem. Nonetheless, the vice president and former Indiana governor also tweeted a photo of himself proudly standing in his luxury box as the "Star-Spangled Banner" was performed. (AJ Mast/AP) Members of the Indianapolis Colts lock arms during the playing of the national anthem before an NFL football game against the San Francisco 49ers, Oct. 8, 2017, in Indianapolis. It was supposed to be a day of football where the main event would be former Colts gridiron legend Peyton Manning retiring his No. 18 jersey. Manning played for the Colts for 13 years before quarterbacking the Denver Broncos to victory against the Carolina Panthers in Super Bowl 50. After he left early, Pence released a more formal statement from his office: "At a time when so many Americans are inspiring our nation with their courage, resolve and resilience, now more than ever, we should rally around our flag and everything that unites us... While everyone is entitled to their own opinions, I don’t think it’s too much to ask NFL players to respect the flag and our national anthem. I stand with President Trump, I stand with our soldiers, and I will always stand for our flag and our national anthem." Pence's exit brought about a sharp shift from less than two hours earlier, when he posted a photo that appears to be from 2014 of himself in a Colts-themed polo shirt with his wife Karen, who was sporting a Colts jersey. “Looking forward to cheering for our @Colts," Pence said in the earlier tweet. (Michael Conroy/AP) Vice President Mike Pence, front center, stands during the playing of the national anthem before an NFL football game between the Indianapolis Colts and the San Francisco 49ers, Oct. 8, 2017, in Indianapolis. The NFL was already tussling with Trump after he delivered an improvised stump speech on Sept. 22, in Huntsville, Alabama. Trump deemed any NFL player who decided to take a knee while the national anthem as disrespecting the Stars and Stripes. "Wouldn't you love to see one of these NFL owners, when somebody disrespects our flag, to say: 'Get that son of a b---- off the field right now, out. He's fired. He's fired," the president boomed to the crowd. Since those comments Kaepernick's mother, Teresa Kaepernick tweeted back: "Guess that makes me a proud b----!" Today, she responded to the vice president on Twitter. Around the league, players, owners and coaches have been answering the president's words by continuing to take a knee during the anthem in solidarity. And already this season numerous college and high school athletes have carried on Kaepernick's silent protest. ABC News' Alexander Mallin and Chris Donovan contributed to this report.